As a designer themer, I used Dreamweaver in the prehistoric passive/static site era until discovering Coda 1 for a lot of in-code-design. Since moving to a modular css files approach, a multi-pane, single window has been essential. I have a lot of panes, there seem never enough (is this an immutable law of the IDE universe of something?). I ached for Coda 2 fundamentally because the tab metaphor was broken: you literally cannot tell which pane/tab is active, let alone which. That is a massive UI fail which I could not contemplate not being fixed in v2 (though it could have so easily been in a dot release, had Panic deigned to deliver incremental improvment). So I bought Coda 2 on faith, and would you believe it? Tabs still broken. in fact they're not even tabs - they're an 'improvement'. Yeah right. I'm appalled that an app so good in so many ways (not to mention lickable) could have such a terrible oversight. So if anyone wants a Coda 2 licence - I can offer one at a good price. I literally hung my head and leapt back into the arms of C1. 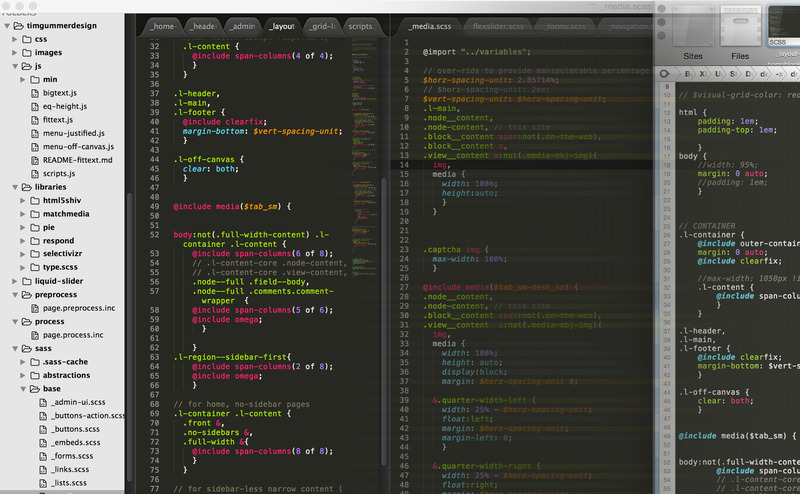 Salvation has come in the form of SublimeText. I'm just edging into this editor now. It doesn't quite get the 'active pane' thing, but crucially it does do tabs proper. Sublime is a whole lot less concerned with looking good but does so anyway. Sublime gets so much right and I have a good feeling about where this goes. There are some non-intuitive things about the UI, but heck, I'm not beyond a bit of learnin' if the ultimate experience will flow. I gather it won't (even with the SFTP plug in) work so well for remote server editing - which, (purists be damned), some of us still need, for shared staging sites with deep nix functionality that isn't practical for mere designers to set up locally. On local dev however, while I have yet to harness the power fo the mighty text based command search thingummy but so far so good. Looking forward to dropping some clams by the way of sublime's sole, hard working developer. Long may he/she prosper.